From the time I was a kindergartener through most of my undergraduate career, I have wanted to be a teacher. When I graduated from Bethlehem Catholic High School in 2012, I began to pursue that dream at Kutztown University, where I majored in Spanish education and English as a second language. It was not until I was at Kutztown (between my sophomore and junior years) that I began to seriously consider a vocation to the priesthood. From that time I began meeting with a spiritual director and praying very earnestly about what God was calling me to do with my life. I remained active in my faith during that time, serving on the St. Christopher Catholic Newman Council on campus and helping out as an alumnus with the Bethlehem Catholic High School retreat program. I enjoyed these ministries and could see myself living a life of ministry to the Church. However, I still wanted to be a classroom teacher. My student teaching experience at Reading Intermediate High School was a profound part of my discernment of this. The students and the people working in Reading to make a difference were an inspiration to me. I witnessed teachers who went the extra mile for their students and showed them that they were loved. I came to realize during this final stretch of my time at Kutztown that what was most valuable to me about teaching and a lot of what tugged at my heart about a vocation to the priesthood were the same: self-sacrifice, building community and loving the people you serve. God spoke through those moments. After much thought, I was at ease and called Monsignor David James to meet about entering the seminary for the Diocese of Allentown. I echo the words of St. Paul as I reflect on my family, thanking God at every remembrance of them and praying with joy for them each day. I am inspired by the way that my deceased grandparents, Adella and Peter Kuna and Evelyn and Frank Bannon, lived their Catholic faith. Their home parish of St. Rose of Lima in Carbondale was the center of their lives, and they raised their families to know God and love him. I am grateful for my extended family who supports me wholeheartedly in my discernment. My maternal grandmother’s three brothers were also Catholic priests: Monsignor Thomas Horan and Monsignor Kenneth Horan of the Diocese of Scranton, and Father Walter Horan of the Dominican Friars, Province of St. Joseph. Now deceased, they each left a tremendous mark on our family and on the communities where they served. Monsignor Tom was a seminary rector and the long-time pastor of his home parish. Monsignor Ken led Catholic Social Services for his Diocese and ministered to adults with disabilities for most of his priesthood. Father Walter taught Latin, theology and history in a high school, and preached novenas and parish missions. They lived their vocations with tremendous joy, and I pray each day to live mine with the same fervor and fidelity to Christ. For a number of reasons, I am indebted to the friends I made at Kutztown University and the St. Christopher Catholic Newman Center, who have supported me in my discernment of the priesthood. These authentic relationships truly have helped me grow as a person and as a Christian. At St. Thomas More School (Allentown), Bethlehem Catholic High School, Kutztown University and the Reading School District, I met many teachers whose passion, love for the classroom and skill inspired me to follow in their footsteps. More fundamentally, they taught me the importance of self-sacrifice, building community and loving those we serve. My interests include keeping up on politics and what is happening in the world, reading, spending time with friends, and exploring the great things the city of Philadelphia has to offer in my free time. I enjoy traveling and visiting new places. Above all, the shore is probably my favorite place to relax. The heart of life at the seminary is prayer. It is a place for us to discern our vocations with the Church, seeking to be transformed by the love of Christ. We celebrate Mass and the Liturgy of the Hours as a community – the most important part of each day – and take classes that have challenged me to understand more about the Church, to learn how faith and reason complement each other, and to think critically about contemporary culture. Seminary life also fosters a spirit of fraternity among the men studying here. Two of my favorite ways this happens is at the breakfast table and in our service outreach. At the seminary, I have met some of the most authentic, generous, and intelligent people just by sitting with them over a cup of coffee and a bagel in our common room. I am continually amazed at the gifts and talents they bring to our community. Also, our semi-weekly “Jesus Run” brings together seminarians from the College and Theology houses to minister to the homeless of Philadelphia. We walk the streets of Center City in small groups, offering food, distributing clothing, and offering encouragement and prayers for those whom we encounter. As we seek the face of Christ in the poor among us, we are simultaneously growing as a brotherhood of men rooted in him. 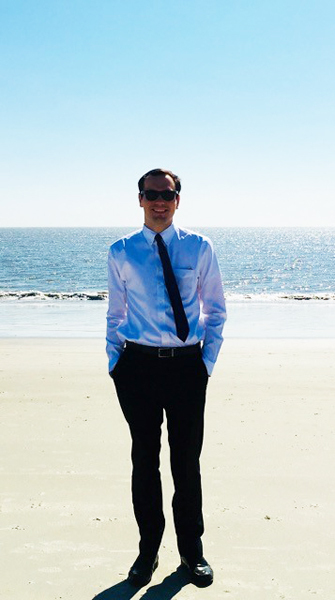 Matthew Kuna, Diocesan seminarian, enjoys time at one of the beaches he regularly visits.